20somethingmum is a fan of chick lit, so was looking forward to reading the newest novel by Lisa Jewell, "The Making of Us". So, was it a must read? 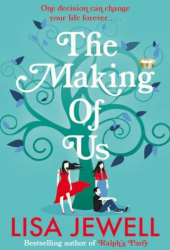 The Making of Us is a new book by Lisa Jewell, and introduces us to a set of brand new characters. The idea behind the story- of the consequences of having children via a sperm donor, is original and very well thought out. There's no schmaltz to the story, I think some other authors would have directed the book that way. The characters are all linked via one man, Daniel, who lies in a Hospice with secrets of his own, and nearing death wishes to find out what became of the children whom he fathered but never got to meet. We then find out ourselves what the children, now adults, are all doing, and find that all of them have something missing from their lives that they can't quite understand. Firstly, we meet Lydia, who was brought up by her Father after her Mother's death, with no idea that her Father was indeed another man. Lydia is removed from society, and despite her wealth, she isn't truly happy and has no idea why she feels that way. That is until a mystery person sends her details about "Donor 32" and the Donor registry for those who wish to find out if they have half siblings. This leads us to Dean, your typical estate boy, who is trying to avoid grieving for his dead girlfriend and can't face up to his responsibilities as a Father to his own newborn daughter. He wants to know who his Dad is, and one drunken night signs up for the registry. The story flows so well, its one of the most believable book I have read since David Nicholl's One Day- you end up rooting for the characters, hoping that, in meeting each other and answering the questions they have they can finally be happy together. I think Lisa must really have researched the positives and negatives of searching out siblings (and of course biological parents) via the Registry, and how it would impact on someone finding out that the people they believed to be their parents and the circumstances of their births may be different to what they thought. At times the raw emotion, especially in the last half of the book with Lydia travelling back to Wales with Dean, is so believable I found myself having to put the book down and have a good dab at my eyes with a tissue! The only negative was the sub story of Lydia's personal trainer and later lodger (and lover) Bendiks, who you think you know what's going to happen but then Lisa takes the "happy ending" way out of closing that storyline, perhaps to spare the reader, and the character, of anymore emotional sadness. A great summer read, full of all the best of chick lit- emotion, happiness, fun and likeable characters- I would love a sequel to find out what happens to the siblings and to Maggie, Daniel's friend who helped get them together in the first place. I urge you to read it as you wont be disappointed. I certainly wasn't, nearly staying up all night as I was so lost in the story! I'm reading this book now and also enjoying it. Good review but you've given a lot of the story away - Maybe add a spoilers alert.